Always be a few minutes early for any important occasion, especially for nerve wrecking ones. If you are early you’ll have enough time to relax and assess your surroundings. It will also make a good impression and will show that you are responsible and punctual. You can also spend that time to check yourself, as to how you are dressed and gather your thoughts. However don’t be too early. You’ll just look silly and have nothing to do with your time. When you’re waiting try not to flip through magazines or check your phone. Don’t be earlier than 10 minutes before the interview. As strange as this may seem, ask a close friend, or even your mirror to practise a mock interview with you. You will feel more prepared and will look calm and composed on the final day. You can go over what you intend to say and how you want to say it so that you are not caught off guard then. You will also be able to correct your body language and posture. However do not learn any answers as you will come across as fake. 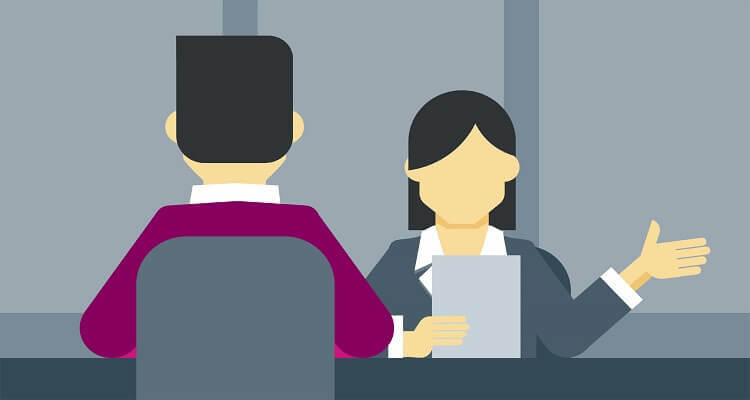 Know what type of questions they are likely to ask you and try to get some information about the company you are applying to, the position or even the interviewer. You want to know as much as you can but don’t over do it either. After all you’re going there to talk about why you perfect for the job and not to give them a description of it. You’re doing your research to get a better understanding of what they are looking for and hence you can emphasise on your strengths accordingly. How you sit and how you talk is extremely important. When you walk in don’t rush to sit down, exchange a firm handshake and always smile. Not a goofy smile but a polite, professional one. During the interview sit straight and don’t slouch. Keep your phone off from the moment you enter the building to the moment you leave. Don’t even play on it or do some last minute work on it in the waiting room. Always introduce yourself using your full name and address everyone politely. Be polite to everyone, the receptionist, the person escorting you to the interview room, even people in the elevator, you never know how that may make a difference. Have a firm handshake and always maintain eye contact. Don’t be cocky or arrogant while going so though. If you think you can lie about your experience or your characteristics you are very wrong. Companies do background checks. They will follow up on what you’ve said. A lot of companies today run checks on Facebook and other social media, so go through all your profiles and make sure nothing on them could hamper your chances of getting the job. If however you do have pictures or posts, etc either take them off or make your profile as private as you can. If you are unable to do that, come up with a good excuse or reason. Especially if there videos or pictures of you on the internet when you were drunk or doing something embarrassing, think of what you intend to say when asked about it. UWhile you may feel humour is the best way to break the ice, remember that you are here for a professional interview and you’ve really only got one shot at this. Some people may not get your humour or even be offended. It’s really not a risk you want to take. You could also come across and unprofessional. If you intend to get ahead in life, invest in a nice suit. As much as we hate to admit it, we do judge people on the way they look and dress. So the smarter you dress, the better the impression. No matter what position you are applying for and what job, dress smart and conservative. Check your appearance before you go for the interview, maybe once you arrive at the venue. Make sure your hair is in order, your tie, belt, everything. You don’t want to have any embarrassing wardrobe malfunctions. While doing your research you may have come across some questions about the position or the company or whatever. First research those questions to see if they have already been answered, if not, make a list of these questions. You want to know exactly what you’re getting into and it will also show the interviewer that you have done research and prepared yourself. The key to any interview is confidence. Confidence is appealing, even if you are not a confident person, smile, it will help mask your nervousness. Walk straight and tall keep your shoulders aligned with your interviewer. Create an aura of confidence around you. Be sure of yourself and as the interview goes well your confidence will increase which will further improve your interview. However don’t go over the top. Don’t get so confident that it comes off as arrogance.